The subject of underground warfare below the trenches of WWI received very little coverage at the time or during the decades afterwards. That has changed for the better during the Centenary commemorations. During the last two years a number of fine books have appeared on the subject, somewhat short of full coverage of this terrifying warfare, but a major improvement. Gratifyingly, each of these books has taken a different perspective, or covered uniquely one area of the subject. This new book provides yet another perspective and does so with warmth, affection, sensitivity and completeness. The author has done a very good job on the platform of through research. Essential reading for all WWI buffs but will appeal to a wider readership. DESCRIPTION: The subject of underground warfare below the trenches of WWI received very little coverage at the time or during the decades afterwards. That has changed for the better during the Centenary commemorations. During the last two years a number of fine books have appeared on the subject, somewhat short of full coverage of this terrifying warfare, but a major improvement. Gratifyingly, each of these books has taken a different perspective, or covered uniquely one area of the subject. This new book provides yet another perspective and does so with warmth, affection, sensitivity and completeness. The author has done a very good job on the platform of through research. Essential reading for all WWI buffs but will appeal to a wider readership. In a war of movement, almost anything can happen but the two opposing forces are using land forces to locate the enemy, set a trap, or cut the lines of advance, and then hope to win in a combat of similar units. Defensive and siege conditions are very different. Once a military force has settled down behind fortifications, it may be partly protected by those fortification, but it is also trapped. It can only leave its defences by fighting through the besieging force. From ancient times, the standard method of attacking a fixed fortification is by mining. From long before Roman times, armies included a group of miners or engineers. Their job was to dig under the outer walls of a fortress or fortified city and prop the foundations of the target wall on wooden props. The area around the props was filled with flammable materials and, once the section of wall was supported only by the props, the miners lit the combustible material and made a hasty retreat. Once the props were burned away, the now unsupported wall came crashing down and the besiegers could storm the breach and defeat the enemy. The uses of miners never fully disappeared, but the invention of siege guns produced a fast alternative that was not impeded by water defences. Canon could be ranged against the fortification and focus on one point in a wall, pounding away until the wall failed. Miners also were in lower demand because large armies, supported by supply lines, took part in wars of movement. Cities were often blockaded from the sea by warships, and cities and castles frequently fell because their armies had been defeated in the field. WWI started as a war of movement and the Germans came close to repeating the defeat of the French that they pioneered during the brief Franco-Prussian War. They failed only because the small British Expeditionary Force fought with great skill and determination in a series of rearguard actions that slowed the German advance and made it vulnerable to counter attack. This was defence against greatly superior German numbers and well beyond any reasonable expectation. Even platoon level British forces fought with such ferocity that the Germans believed they were in contact with the main British force. The platoon then withdraw in good order and reformed with sister units to fight all over again. When the British and French launched their counter attack they threw back the German armies but the British were exhausted from their epic rearguard actions and did not have the strength to destroy the German armies, or throw them back into Germany. The Germans used the short respite to dig in and soon a line of trenches stretched from the Channel coast to the Swiss border and faced an equally hasty trench line thrown up by the British and French troops. These trench lines then became deeper and more sophisticated as the war bogged down into a war of attrition with artillery and counter artillery pounding away at the enemy line which might only be a few yards apart in places. Large numbers of Allied and German soldiers died in frontal attacks across the no-man’s-land between the trench systems. The eventual solution proved to be the introduction of armour by the British and the use of mining on a large scale, and with enormous stocks of explosives. 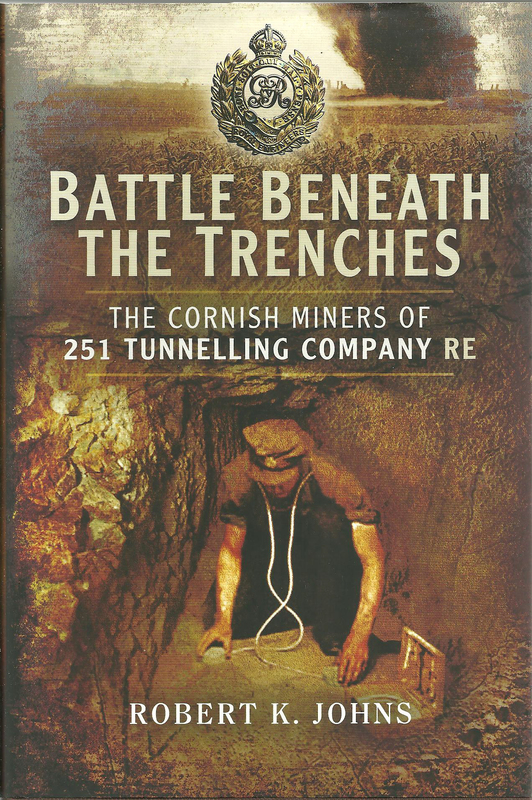 This book tells the story of the Cornish Miners who were recruited to fight a new underground war deep below the trenches. The book contains many illustrations, mostly photographic, and original, to support the readable text. 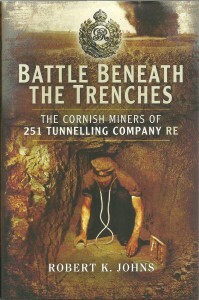 A good combination that holds the readers attention and graphically describes the tense and terrifying war below ground where miners and counter miners fought hand to hand in near total darkness, or exploded a counter charge entombing the enemy. Even for men used to working deep beneath ground and sea to extract tin and other mined materials, this was nerve-wracking work. A valuable and well-researched book that provides a unique insight into a much under-reported form of combat.